I like to complain about Amazon’s shopping algorithm and how it tries to sell me sunscreen, granola bars, and diapers, as if that’s all I ever buy (more true than I like to admit). But like so many others, I turned out on Prime Day to see what deals the retail megaloth might have for me. I was not alone. In fact, pretty much everyone who went to a shopping site on the Zscaler network on Tuesday went to Amazon. 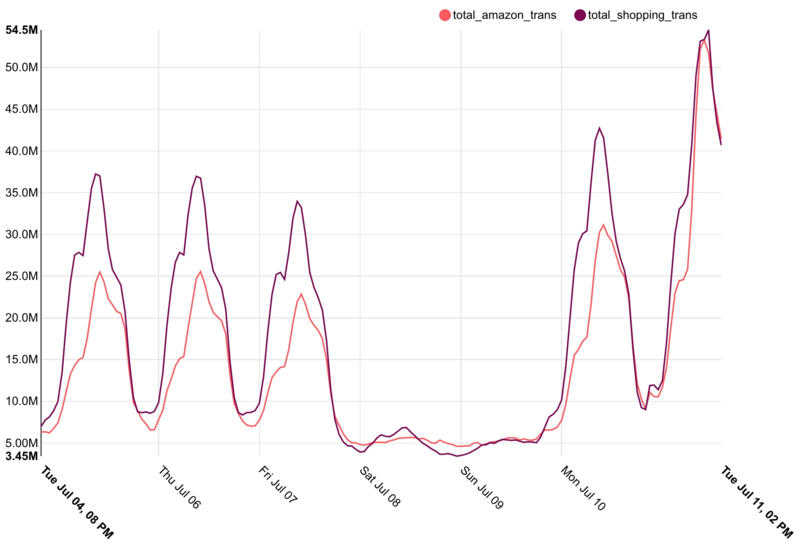 As you can see from the diagram below, Amazon traffic accounted for nearly all the traffic in the shopping category among our 5,000 enterprise customers on Tuesday. In fact, it more than doubled it’s own daily average traffic, showing that even among busy professionals, Amazon can get us to click on a great deal.